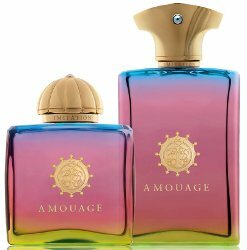 Amouage has launched Imitation, a new fragrance duo. An interpretation of those rare moments when life mirrors art, Imitation is the highly anticipated fourth chapter of the second cycle of the Amouage narrative by Creative Director, Christopher Chong. An intensely personal exploration of New York City in the 1970s, Imitation is inspired by Chong’s childhood memories and his first experiences of a city filled with graffiti, neon lights and a boiling pot of cultures, shaped the way he sees and understands art today. Imitation Woman ~ "An olfactive imitation of New York City’s multiculturalism in the 1970s this floral aldehyde fragrance is a tribute to an iconic era." The notes include rose, ylang ylang, orange blossom, jasmine, blackcurrant, aldehydes, liquorice, incense, sandalwood and patchouli. Imitation Man ~ " An olfactive imitation of New York City’s subcultures in the 1970s this chypre and leather fragrance represents an era of audacious freedom." With cedrat, nutmeg, black pepper, rose, orris, violet, myrrh, leather, vetiver, patchouli and castoreum. Amouage Imitation Woman ($325) and Imitation Man ($310) are available in 100 ml Eau de Parfum. Bottles sport a definite 70s Lilly Pulitzer vibe. I guess, although that seems a bit “off” given the inspiration? I get the name once I’ve read the back story. But otherwise… seems like a name with negative connotations. Yes, I’m not wild about the name either. Bottle is gorgeous though. I like it better than “Beach Hut”. I like everything better than “Beach Hut” it reminds me to much of beachnut gum.